Top Infield Baseball Gloves – Best Looking and Performing? If you’re playing the shortstop or 2nd base position, you really need to put some thought into buying the right infield baseball gloves. If you don’t, you can hurt your team’s chances of winning and you may even get hurt. You need a glove that lets you catches bouncing balls and hard drives. Then you should also be able to more easily transfer the ball to your throwing hand so you can get people out at first base. If you’re fast enough and there’s a runner on first, you can throw to 2nd base and get a double play. This guide will mainly focus on second base, shortstop and third base. For a closer look at 1st base gloves go here. 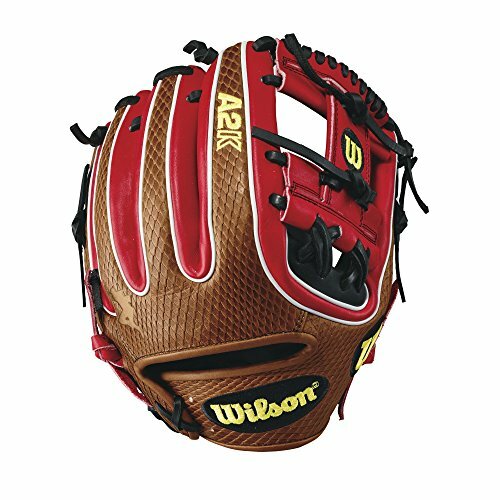 2017 Wilson A2K Brandon Phillips Game Model Brandon Philips is one veteran second baseman, and aside from playing for the Atlanta Braves at almost 36 years of age, he also designed this particular Wilson A2K glove as the best infield gloves for middle infielders. All A2K gloves from Wilson are great, but these have especially unique features. These A2K infield gloves look unique, and that’s due to the Faux Snakeskin for the back fingers. It looks mean and serious when you see it, and it can seem intimidating for other hitters. This offers excellent longevity, as Wilson used only the leather that’s among the top 5% in quality for pro stock select leather. The leather boasts of tighter grains, so it’s stronger than other leather types out there yet it feels soft when you touch it. The double palm construction offers excellent picket stability. The pocket holds its shape better, as the construction extends well into the fingers. You don’t get wrinkles in your gloves so you can close the glove on the ball properly. This is much easier to break in than other premium leather gloves. That’s because it has already gone 3 times the normal craftsman’s shaping in the factory. The dual welting is rolled, so at the top of the fingers there’s a bit of a bend already there. This also helps for a faster break in, as this bend already supports the pocket and the various parts of the glove maintain their shape as you play. Well, it’s about a hundred bucks more expensive than a Wilson A2000. Rawlings Gold Glove Club Heart of the Hide The size indicates that these Rawlings infield gloves are meant for smaller hands. But it plays very big on the baseball field. It also features the Pro I web that filters dirt and lets you get the ball quickly to your throwing hand. It uses Heart of the Hide leather that’s from the top 5% of all steer hide. It also has deer-tanned cowhide lining. It’s very comfy to have on your hand. The open back lets your hand breathe, while the wrist pad is “thermoformed” so the moisture is wicked away to keep your hands dry. Other comfortable features include an index finger pad, and it even has a padded thumb sleeve. This can take a while to break in, though you can say this for the vast majority of premium gloves out there. The color scheme (mostly black with a white pocket and bright orange web laces) can be too colorful for some. 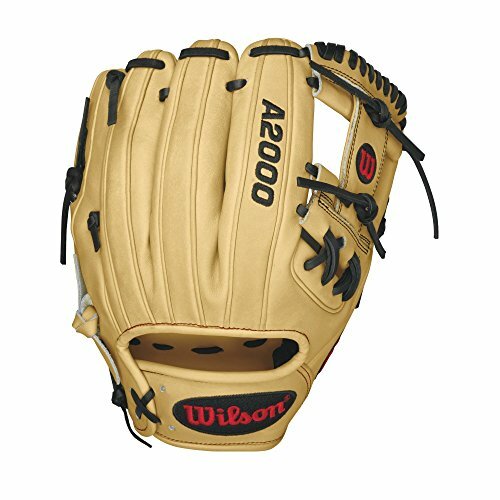 Wilson A2000 Infield Baseball Glove, 11.5-Inch Plenty of players like the A2000 because its price is more reasonable than the A2K, but that doesn’t mean it’s good in its own right. 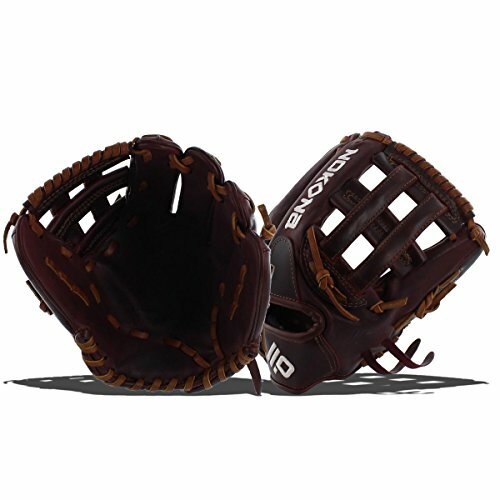 In fact, many in the MLB use these Wilson infield baseball gloves when they play. These middle infield gloves use Pro Stock leather. It also features dual welting so the pocket is more durable. The special wrist lining keeps your glove hand dry. It also breaks in surprisingly quickly. It doesn’t quite have the swagger of the Wilson A2K Brandon Phillips when it comes to looks. Nokona Bloodline Pro P5 Fielding Glove Unlike the Rawlings PRO204-2NWO, this P5 looks serious and utilitarian. It seems like a player who uses this isn’t messing around. It measures 11.75 inches, and it comes with an open H web that’s good for all infield positions (except for 1st base, of course). It’s made in the US. The brand is very famous because it’s named after the name of the town in which it was first established. Many consider these the flagship Nokona model. The Bloodline variant has been reengineered. It uses the Nokona-exclusive Range Kangaroo Leather for the whole shell of the glove. This makes it among the toughest and longest-lasting leathers in the world, yet it’s very lightweight that’s crucial for an infielder who needs quick hands. It also features a special interior padding system. This has been carefully placed in the glove so it offers protection for your hand while it also adds to the stability for the structure and the durability of the glove. It doesn’t really take too long to break in. The open back helps your hand breathe. It can be very stiff when it’s brand new, so some may find it challenging to wear the glove at first. 2017 Mizuno Pro Limited Edition Mizuno makes very excellent gloves, but these are the top of the line models. They’re not only very expensive so that very few can afford it, but they’re also made in small numbers. It’s very likely that if you have these infield gloves, no one else in your team will have one. Unless, of course, if you play for an exclusive private school, in which case every may have one! It’s available in different sizes, including 11.5 inches. It uses Soft Northern European Kip Leather that’s been perfectly conditioned and with tighter fibers. The open back lets your hand breathe. The price is scandalously high, as you pay lot because it’s a limited edition. 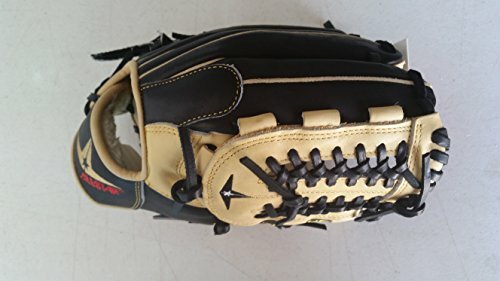 AllStar FGS7-IFL System Seven 11.75 Baseball Glove This brand has long been known for supplying the best mitts and equipment for catchers, and finally they wised up and used their expertise for infield baseball gloves. These are their premium quality gloves with the I Web, and the brand has made it really competitive as it doesn’t come with the usual premium price tag. It’s very affordable, and it’s the most affordable on this list. It uses premium quality Japanese Maruhashi Black and Tan leather. This is the tough leather that’s actually used in All-Star’s catcher’s mitts. The tan leather inside makes for an excellent pocket, while the black leather provides the support for durability. The pinky stall can fit in 2 fingers so the glove can close more fully. It comes with Pro Guard padding that kills the sting of line drives. But it’s still thin enough so you can feel the location of the ball in the glove as you transfer to throw. It’s very stiff at first, and the break will take some time. So how exactly do we find the right glove for you? Brand and model. If you insist on playing your best, you need to pick from the top of the line models of the most reputable brands. Getting a no-name brand just won’t do and it can really hurt your play and your hands too! Cost. Yes, famous baseball brands and top of the line models can be pricey, but you can find deals online that’s much better than getting it from a retail sporting goods store. Also, some brands may offer lower prices so they can compete better in the consumer market. Position suitability. If you’re a middle infielder, you need an open web design that lets you get the ball out faster so you can throw quickly to 1st base. This open web also lets the dirt out when you’re scooping in ground balls. For those on 3rd base, you need as glove that offers more support with a semi-closed web design so that you can catch those super-fast line drives without hurting your hands and destroying the glove. Size. Usually these infield baseball gloves go at 11.75 inches for youth players, though are in 11.5 inches for those with smaller hands. Others may be available for 12 inches. Quality of the leather. You don’t want the leather just to look good. It should be very durable so it can hold its shape once you break it in. With the top of the line leather, you may expect a glove lifespan that exceeds a single baseball season. Break in process. Some gloves take a while to break in, though others have been partially broken in already in the factory. Features for fit and comfort. You need a glove that feels great and comfortable in your hand so you’re not distracted. Durability. Aside from the quality of the leather, you may want additional features for durability. Pick the right glove for your position and budget, though ANY of these infield baseball gloves will certainly help you play your best! 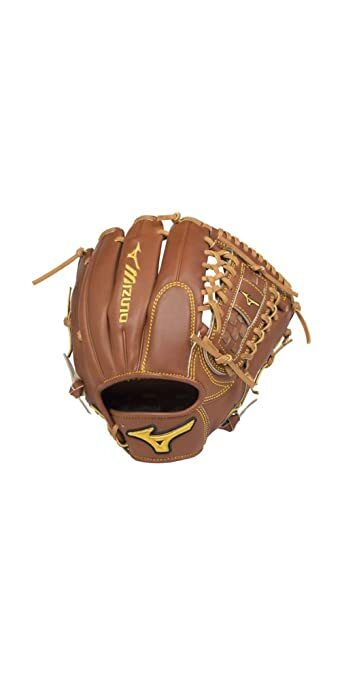 If there is any model you personally consider to be the best infielder glove let me know because I’d like to review it. See All Infield Mitts on SALE TODAY.